It takes precise intuition to own a conversation these days. In a sea of retweets and short-lived news cycles, there is a power in making a clear, definitively timed statement. The art of when is more important than ever as consumers: time poor and experience hungry, are looking for things that meaningfully stand out. For brands that want to truly engage it means becoming more creatively intuitive, elusive and time-sensitive, and relevantly bold in everything they do. Stellar cultural voices and brands that own the conversation today know when to bring an idea to life. For instance, during a time when town criers warn of a retail apocalypse, streetwear brand Supreme has cool kids lined up waiting outside its stores for the latest timed drop or seeking out Supreme-branded metro cards and newspapers. Supreme’s subversive school of marketing delivers on two powerful elements of when: the ability to change the conversation through surprise, and in an era of ongoing duplication and manipulation, by delivering something coveted for a limited amount of time. The artful mastery of when also happens when a cultural catalyst pays close attention to the underlying shifts in the zeitgeist. Apple did this in the eighties by extolling the power of thinking differently during the rise of corporate-driven personal computers and at a time of a nascent sense of individual creativity. The brand has continued owning the conversation by adopting a secretive, drop-like mentality around its design and product launches. A recent branded mic drop was Nike’s ads supporting Colin Kapernick. 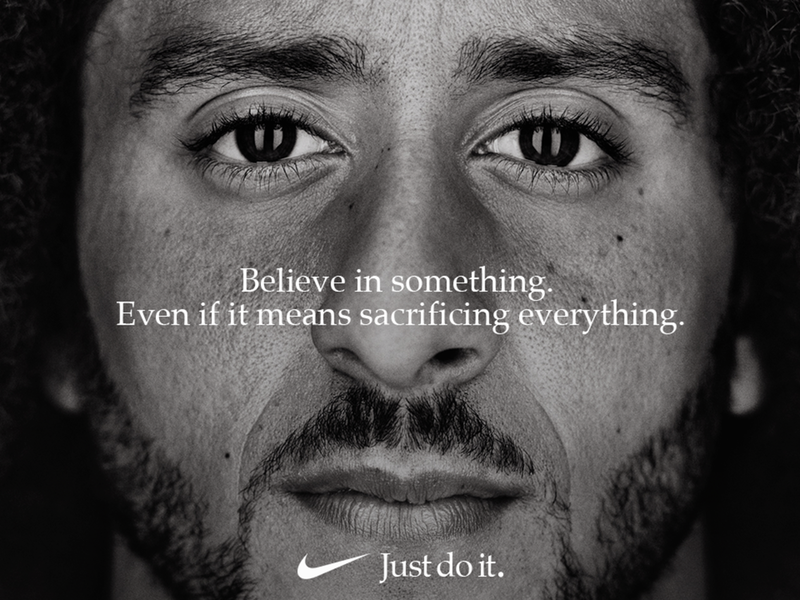 The brand, confident in its rebel (albeit its behemoth corporate status) history and DNA, lived up to its “Just do it” tagline and went all in to make a statement supporting Kapernick’s social stance. Stealth-like in its approach, Nike simply posted the ad with no further explanation. In doing so, Nike brand managers knew that they would offend many, yet powerfully recalibrate a more meaningful relationship with a younger, more socially-focused consumer. Besides having something powerful to stay, the mic drop and its brethren, the drop, challenge social media’s frantic always-on culture. When Beyoncé secretly launches a visual album like Lemonade overnight, she is rewriting the rule book, favoring elusiveness versus a Kardashian-like school of overexposure. Mic drops like Beyoncé’s favor statements so clear and relevant that they hijack all other conversations. There is an aura of boldness around the act that elicits desire. For a generation used to consuming things on their own terms, the drop also creates a sense of urgency around access: being the first ones to experience something while it’s taking place. We see this in the popularity of festivals, wanderlust-fueled travel, capsule collections or the appeal of ephemerally-timed Snapchat stories. The drop can also serve as a break or edit from the sensory overload around products and branding messages. Subscription boxes like Blue Apron and Birchbox thrive by both giving individuals a monthly surprise while canceling out the noise of overtly merchandised retail. They also give consumers welcomed predictability in an increasingly uncertain world. The power of the drop is ultimately around creating a system of extreme fluidity around cultural conversations. The potential is vastly expanding in this realm as AI technologies now allow us to go wider and deeper in terms of canvassing popular sentiment. For brand leaders, adopting a "drop" mentality means fluidly weaving the power of the high tech with good ole human intuition to design brand experiences so relevant and timely that they build powerful emotional and cultural equity for the brand. And in an era of constant disruption, being hardwired to intelligent disrupt through emotions is the most powerful of drops.